The Lonely Island's hip-hop classic rendered in glorious t-shirt artistry! 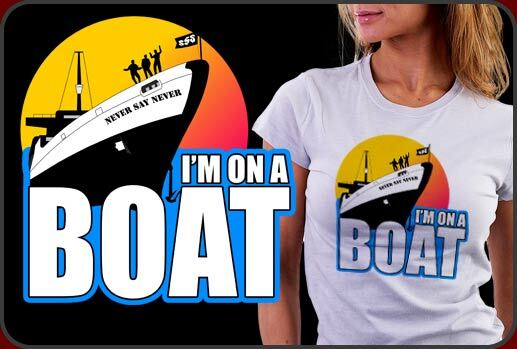 Our Im On A Boat Shirt is a spoof on the hit video by The Lonely Island "Im on a Boat" The video is hilarious and the song is actually quite catchy so the video turned viral easily. This is a very unique I'm On A Boat Shirt featuring several images from the video. From the ship's name, Never Say Never, to the dolla billz in the ships flag and the three performers from "The Lonely Island" in silhouette on the deck of the yacht, this is a very attractive and funny shirt to own. We have our Im On A Boat Shirt for men, women and children and they look terrific on any color shirt you choose, either light or dark.